Geneva motor show 2012: Dacia Lodgy | What Car? The Dacia Lodgy has had its world debut at the Geneva show. It's yet to be confirmed whether right-hand-drive versions will be made, but prices for entry-level models start from 9,900. 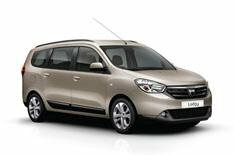 At 4.5 metres long, the Lodgy is longer than a Renault Scenic, but shorter than a Grand Scenic. In seven-seat configuration, the third-row bench seat can be removed completely or else folded up against the front seat backs. Inside there's 2617-litres of space in two-seat configuration, 827-litres as a five-seater and 207-litres when all seven seats are in use. Two petrol engines will be made available, the 1.6 MPI 105 and the new, turbocharged 1.2 TCe 115 with direct fuel injection. There are also two diesels, both based on Renault's 1.5 dCi engine, in dCi 90 and dCi 110 form. There is no word on fuel economy and emissions figures as yet. Customers will be able to opt for Dacia's new MEDIA NAV, which incorporates a radio, auxiliary sockets, Bluetooth and sat nav, all for 430. The Dacia brand will be launched summer 2012 in the UK, when the Duster SUV will arrive in showrooms and buyers will be able to pre-order a car prior to first customer deliveries in December. The Nissan Qashqai rival is expected to start at less than 10,000. The Dacia Sandero supermini will go on sale in January 2013. Entry-level versions are expected to cost around 7000. The Duster and Sandero will probably be offered with 1.6-litre petrol and 1.5-litre diesel engines. ?? Dacias will be sold in specific areas of every Renault showroom on a basis of value but no haggling.